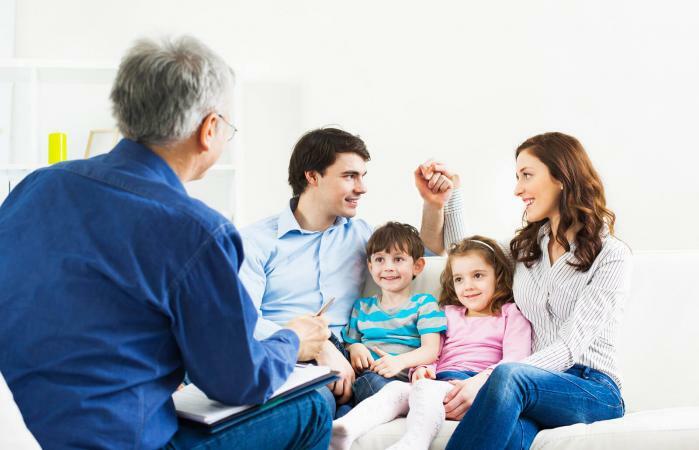 Family therapy is a form of counseling intended for couples or small families who might be struggling with a variety of concerns affecting the family unit. Understanding your needs as a group and your learning styles can help you choose which type of therapy will be most effective. Cognitive behavioral family therapists see family members on an individual and group basis to get the whole picture. The goal is to help the family become more stable by identifying the patterns that surround the areas of conflict. This, in turn, can provide a better understanding of the problems themselves. Individuals are challenged to identify their role in these patterns and learn new ways of adapting or communicating. It's all about talking through your issues and changing your own thinking and behaviors in ways that help the whole group. Each individual works on their own growth as a means to help the family. Because therapy is solution-focused, it is often brief. Cognitive behavioral therapy (CBT) teaches strategies that can be useful in other areas of life. Each individual must commit to being open and working toward difficult changes. It involves confronting your own emotions in discussions, which can be highly uncomfortable for some. The specific and structured focus might not address larger family issues. Family systems therapy, or systemic therapy, focuses on the interaction between families rather than individual reflection. This form of group therapy centers on the belief that an individual's behavior influences family function and vice versa. The main goal is to change elements of the group dynamic, such as closeness and boundaries, as a way to change each individual's experience. Interventions often involve encouraging the family to find new ways of solving disputes and issues because their ineffective solutions are what has made them unhappy. Blame is never placed and there is no direct identification of a single root cause to any problem. The whole family attends therapy together as a group, so it becomes a shared experience. The therapist is not given the role of the expert, but rather acts as a catalyst for the family's own change. Success requires most family members to agree on a positive outcome from the therapy. The time commitment is high. The entire group has to be willing to participate. The goal with structural family therapy is to create a healthier family structure with positive communication and interaction between members. A therapist observes your family interactions then creates a chart of your family structure. They identify what structural changes are needed and use a variety of interventions to help you make those changes. Strategic family therapy avoids in-depth analysis of the problems and instead uses focused strategies to help the family communicate and problem-solve better. There is a focus on behavior outside the therapy session rather than in the counseling space. The belief that change can occur quickly means you typically only need to attend up to 10 sessions. Therapists encourage change based on the family's own awareness, which makes the changes feel more natural. Families can use the successful strategies to problem-solve on their own in the future. Success depends on the therapists ability to design strategies accurately for the family. Family goals must be clearly defined and agreed upon. Family members must take an active role outside the counseling sessions. Each type of family therapy is based on the concept that every dysfunctional behavior has deep and wide roots that extend beyond the individual. Instead of placing blame on one person for behavioral issues, consider how the whole family could be a part of the problem and the solution.